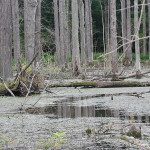 Dan Miltner noticed something moving on the banks of Champion Creek. Miltner, one of about 25 volunteers who were cleaning up a half-mile stretch of the creek west of Roscoe Ewing Park on June 5, quickly realized it was a fawn tangled in the underbrush. Miltner, a Medina Township resident who volunteers with cleanup sponsors Western Reserve Land Conservancy and Rocky River Watershed Council, went to free the struggling animal but thought it might have a broken leg or other injuries that would prevent it from walking. He was happy to be wrong. “I set her down and she ran right down a (deer) trail,” Miltner said. Other items picked up by volunteers were not nearly as cuddly. They included two leather Wilson footballs, a rusty hot water heater, a volleyball, a pickup truck bed liner and several tarps. 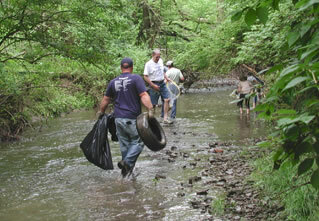 The volunteers, who started at the park and worked their way toward downtown Medina, filled 51 bags with trash. 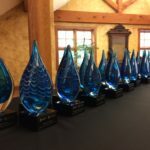 The annual event was sponsored by the city of Medina, the Medina County Soil and Water Conservation District, the Rocky River Watershed Council and the Land Conservancy. Cleanup volunteers included Medina Mayor Dennis Hanwell, Medina Councilman Mark Kolesar, Ivan Hack, chairman of the watershed council, Ed Kelly, chairman of the Brunswick Green Advisory Group, Bill Jordan, associate field director at the Land Conservancy’s Medina office, and Beth Schnabel, education specialist for the soil and water district. 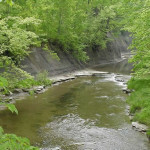 Champion Creek is a tributary of the West Branch of Rocky River, which joins the East Branch in Cuyahoga County and flows into Lake Erie. The stretch of the creek targeted in this year’s cleanup is part of a corridor the city is considering for redevelopment.